Other Products by Ghost Lifestyle. Search other Vegan Protein products. With Pea Protein, Pumpkin Protein and Watermelon Seed Protein! Fortify Smoothies and Baked Goods. 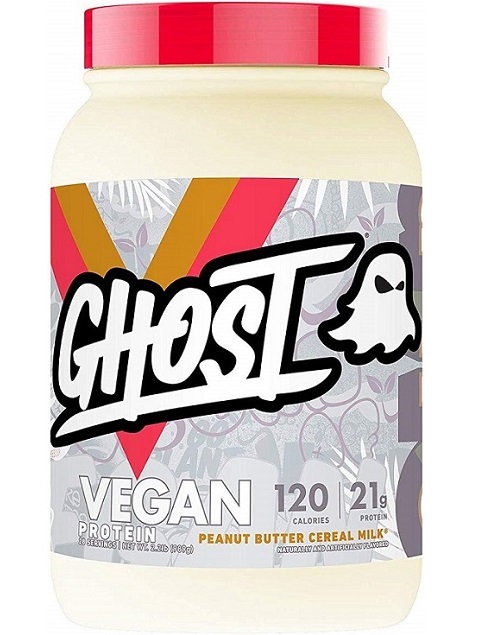 Vegan Protein is another classy nutritional supplement from Ghost. This company has risen to fame with their flare for capturing the interests of sports nutrition and wellness enthusists. Why is this? Because they provide a premium quality product that tastes awesome, and they are completely open about what goes into their product, doing their utmost to ensure that the consumer is not misled in any way. Isn't that sweet? Pea Protein is all the rage. No longer does the vegan or dairy intolerant (or allergic) have to worry about missing out on a protein powder that delivers exceptional quality biological value. Pea protein, making up the majority of protein in this product, has certainly got it all. The humble pea is starting to become ... well, not so humble. In fact, it may very well be proud of the fact that every year there is more scientific research to validate its use. Evidence has shown that pea protein promotes muscle thickness just as well as whey protein1. Boom! How about that ... And if you don't want thick muscles- that's cool. In this study their muscles thickened because they were regularly engaged in weight-bearing exercise. To clarify, the exercise was the stimulus for muscle thickness, while the pea protein simply promoted faster recovery. But pea protein will help your body adapt to any form of execise- not just weight training. That's the beauty of essential amino acids. If you prefer running or swimming, badminton or ballet, or simply want a product to complement the protein content of your diet, then that's fine too. The amino acid content of pea protein covers all 9 essential aminos, including the branched chain amino acids (BCAAs) and tryptophan2. This is what makes or breaks a protein powder- the essential amino acid (EAA) content. Also important is the balance between these amino acids. If we have heaps of one EAA and very little of another, then the body has a difficult time utilising the EAAs as a whole. This is the essence of bioavailability. The EAAs work as a team, and all good teams need every member to be working at their peak. Fortunately, as practical research is indicating, pea protein has a formidable balance of EAAs, naturally contains BCAAs, and has more fibre than most protein powders, making it a little more filling. This is certainly a plus if your trying to keep the calories down. Ghost have done a fantastically cool job of making another product that is scoop-worthy! Be sure to sip this one slowly and savour the flavour. Mix 1 Scoop (35.3g) into 250ml Cold Water, shake and consume. INGREDIENTS: Pea Protein Concentrate, Organic Pumpkin Protein, Watermelon Seed Protein, Natural and Artificial Flavours, Peanut Flour (adding 1 gram protein), Sunflower Creamer (High Oleic Sunflower Oil, Tapioca Starch, Tapioca Dextrin, Natural Flavours, d-Alpha Tocopherols), Salt, Sucralose, Xanthan Gum. FREE FROM: Gluten and Soy.